The bombing of these coastal towns by German ships was a major public event in the early months of the war, causing destruction and civilian deaths. The towns came under attack because they were on the North Sea, a site of particular strategic importance in the naval war. Germany had a major naval base off their north coast at Heligoland, and the bombardment of English towns may have been in retaliation for an attack on this German base in August 1914, or to provoke British ships into action that would expose them to attack. On the morning of the 16 December, German ships off the coast fired explosive shells at all three towns for approximately one hour each. The important point about this attack, in British eyes, was that Hartlepool, Scarborough and Whitby were mainly civilian towns, with little military importance. Whitby and Scarborough had no coastal forts or defences, and Scarborough in particular was mainly known as a popular seaside holiday destination. As a result, the attacks were more notable for their civilian casualties and damage to buildings, than for any impact they had on the balance of power in the North Sea. The Illustrated London News reported a total of 515 civilian casualties across the three towns, and highlighted the stories of individuals and families who had suffered. The last time Scarborough was attacked from the sea was in the year of William the Conqueror’s Invasion of England, 1066. The event featured enormously in public ideas of the ‘barbaric’ German enemy, and was widely discussed as an act of wicked depravity. A young Winston Churchill, as First Lord of the Admiralty, wrote his sympathy to the Mayor of Scarborough, over the sorrow caused by German “babykillers of Scarborough.” The phrase was quickly taken up, and used in The Illustrated London News on the 2nd January 1915, as well as in the Daily Mail later that month. Feelings like this were useful to the British war effort, and propagandists used the event to motivate Britons on the home and foreign fronts. ‘Remember Scarborough’ became a slogan of the war, particularly in the North of England. 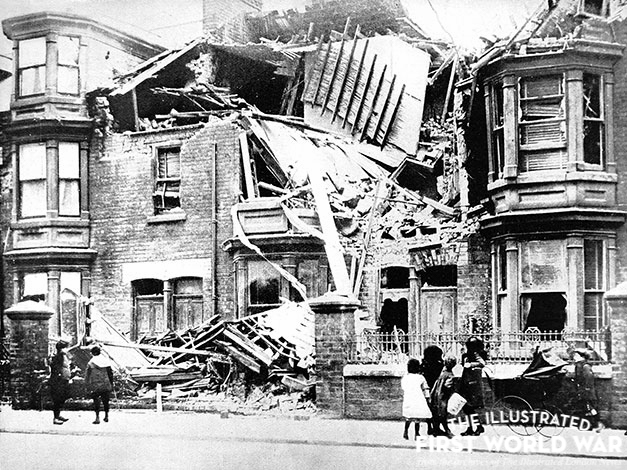 Click here to browse the archive for articles related to the bombing of the British east coast.